Sound Affects PremierInterviewsNAMM 2018 PRS Announcements! 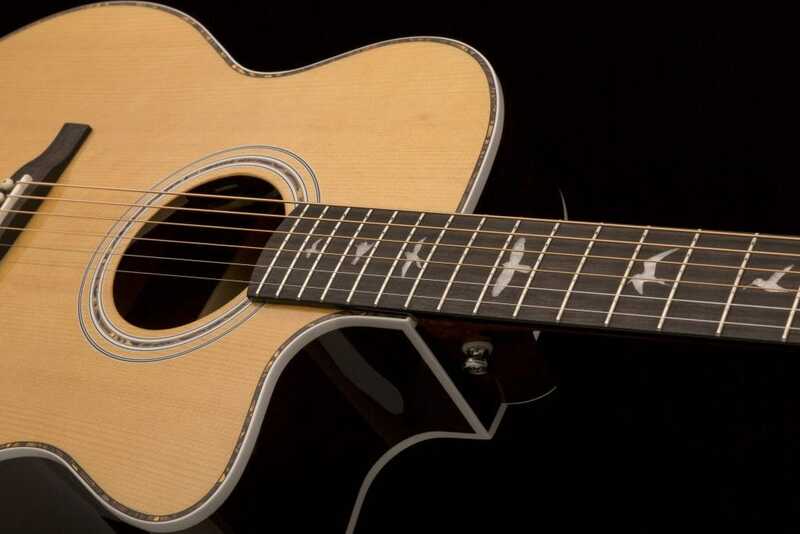 PRS launched a new suite of SE Angelus and Tonare acoustics earlier this month, with a brand new hybrid bracing and some other updated appointments. These guitars are already in our store and online, readily available to see and demonstrate. follow the links to see more! At the meaner end of the spectrum, this heavy-hitter boasts the striking combination of a modified Pattern Thin satin maple neck and hollow birds inlays. Satin black tuners, knobs, and a Floyd Rose double-locking bridge are worthy appointments that complement the satin Grey-Black, or Waring Burst finishes. Complete with Waring’s signature Mojotone ‘Tomahawk’ humbuckers – hot pickups with buckets of low-end and excellent clarity under high-gain settings. This guitar is on pre-order with us – the order window ends 31st of March. Catering to the guitarist who enjoys classic looks but craves tonal versatility, the feature-laden S2 studio features a three-pickup HSS configuration. Mahogany body and neck construction are met with solid White, Black, Tobacco Sunburst, Frosted Blue or Frosted Green finishes, with either tortoiseshell (Black/White/Tobacco Sunburst) or mint-green (Frosted Green/Frosted Blue) Pickguards for a truly vintage vibe. The Pickup configuration features coil-tapping to split the bridge humbucker for single coil tones, but strays from the norm in the middle position/position 3, to incorporate the bridge and neck pickup together, rather than the isolated middle pickup. This guitar offers vintage voicings for blues, classic rock, jazz, country and rockabilly players, and is well worth checking out! the window for orders on this model is up to the 31st also. Only 60 of these guitars are being made, and one is coming our way in April/May(ish?). These private stocks feature highly-figured flamed Maple tops and backs, African Mahogany sides, and a rare figured flamed Mahogany neck. African Blackwood fingerboards and Maple binding really make these guitars stand out, especially when dressed with Agoya birds inlays, blue paua purfling and a selection of stunning private stock finishes. The poster boys for these private stocks are the Laguna Glow and the Platinum Smoked Burst, with most of the other finishes kept under wraps including ours – McCarty Glow Smoked Burst. However past private stocks in this finish have been jaw-dropping, and we expect that this one will be no different. 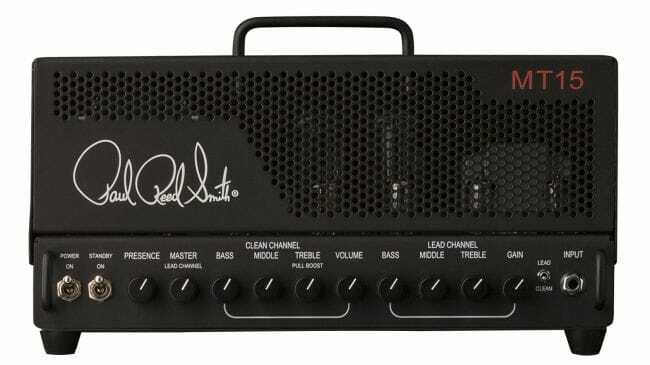 The newest announcement in the run-up to NAMM is this – The MT-15 low wattage amp head developed in conjunction with PRS long-time endorsee, Mark Tremonti. 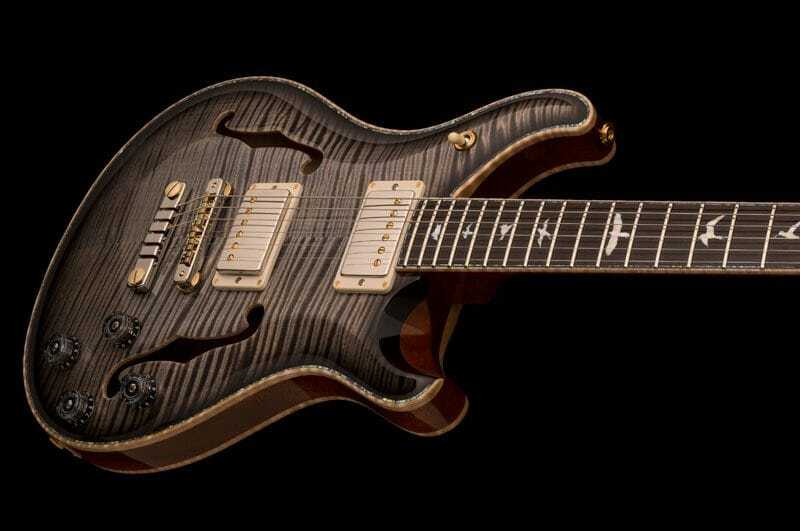 PRS has been steadily making a dent in the heavy rock/metal market: Tremonti signature guitars, Mark Holcomb Signature SE’s (as well as 7 and 8-string private stocks), Archon high-gain amplifiers, and the aforementioned Dustie Waring Signature CE model. Without a doubt, PRS have succeeded in the realms of heavy music – no surprises there given their reputation for quality across the board. This new amplifier is a two-channel lunchbox amp ready to cater to the heavy player who requires lower volumes for home play or smaller venues. The clean channel is warm but articulate and can be pushed into crunch territory thanks to the push-pull boost control. The amp passes through five gain stages before reaching its optimal, harmonically-rich distortion sound, and is Switchable between 7 and 15 watts for even quieter settings. There’s no price or release date for this one yet, as it’s hot off the press, but we are certainly excited! NAMM officially gets underway tomorrow (25th January), where we will no doubt find some further new announcements from PRS and many more brands. We will keep you posted here!